Asaad Arabi opens L’habitat et l’habite, a solo exhibition at Galerie Frederic Moisan in Paris from 13 April - 13 May 2017. Arabi will present a selection of figurative works spanning his fifty-year career. The seminal artist is experiencing a renewed interest in his work. An example of his abstracted Damascene cityscapes from the 1960s is currently on view at Yale University Art Gallery as part of Modern Art from the Middle East, a range of paintings and sculptures that represent a cross-section of regional modernism drawn from the Barjeel Art Foundation. 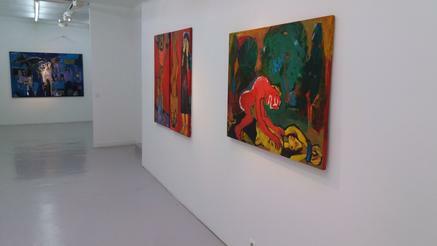 Image: Installation view, L’habitat et l’habite, Galerie Frederic Moisan, courtesy of the gallery.